Weather – Warm and sunny. Highs all week high 90’s. Nightime dropping to high 70’s. Pretty humid. Not unusual to get some electrical and thunderstorms and showers here and there. Nothing lasts long or affected the fishing . Water – Blue with surface temps high 80’s. Great snorkeling and diving time. Some thermoclines down 30′-40′ much chillier by 5-8 degrees. 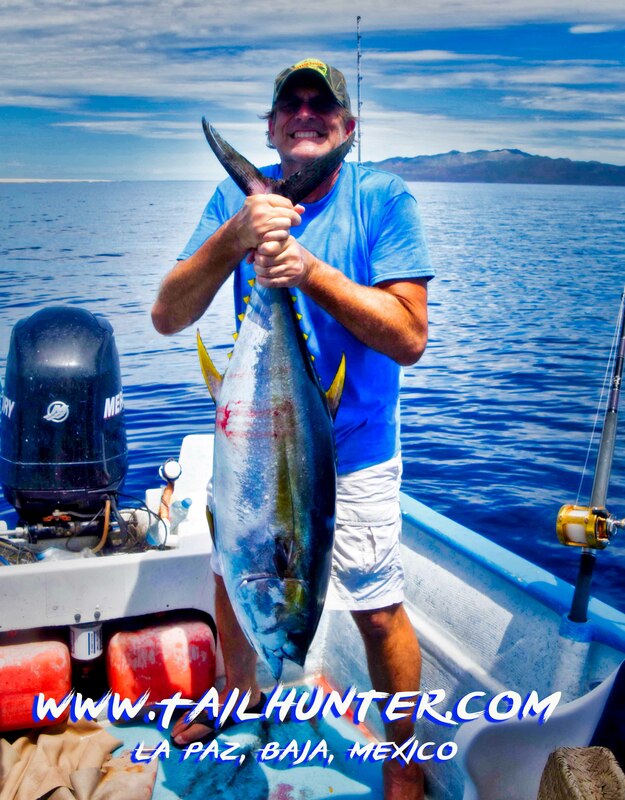 Fishing – More football-sized tuna showing up in the 10-15 pound class, but big bruisers still around. Dorado are 80% of the catch, but the bite is often later in the day for the dorado. Catching – The bigger the fish, the more we lose. Lost some wahoo and billfish this week. So, no photos, but the fish are there! Eric Hill visiting us for the first tim from Colorado rocked it with a hefty yellowfin tuna off Punta Arenas . After you’ve been fighting a big fish in the hot sun for a long time, it’s kinda hard to lift it for a photo as Jules found out in this photo. Punta Arenas and Cerralvo Island in the distance. I couldn’t get a photo of Donovan Ackerman and his big dorado, but I do have a photo of the big dorado with Captain Ramiro on the beach at Muertos Bay. 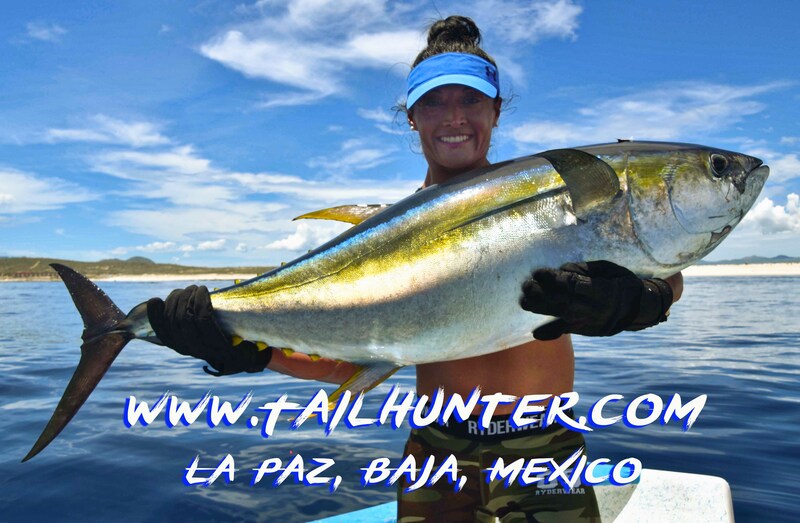 Laura Hernandez with another fat fat yellowfin just off the beach at Arenas. Laura is from San Diego. 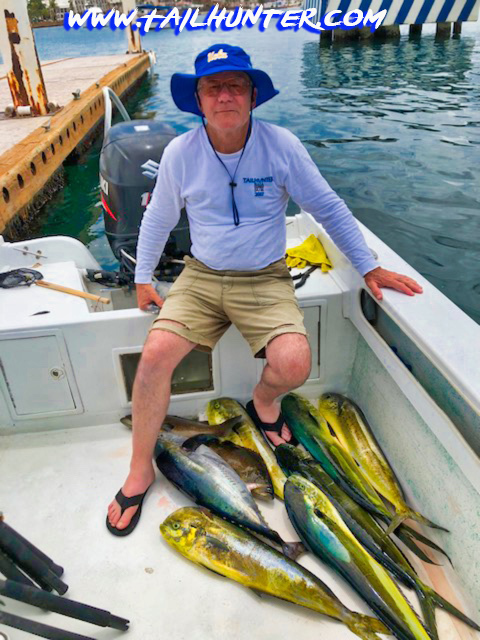 Amigo, Roger McCracken from Oregon was fishing with Shelly Donnell north of La Paz when they had a good day on the dorado and even a football tuna. The right kind! 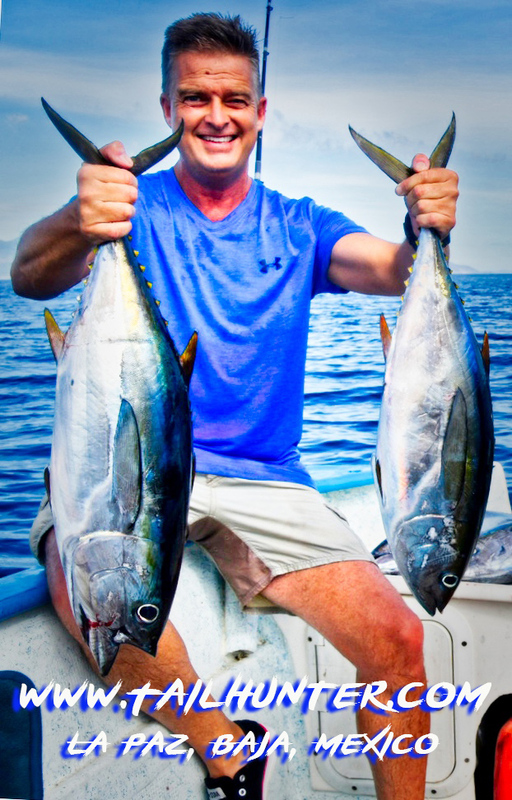 Nice football tuna double-fisted by Mark Buchanan from San Diego. We had more of a fairly typical summer fishing week these past few days. Temperatures in the high 90’s with night temps in the high 70’s. Days start often with clouds then the Baja sun busts through giving way to stronger breezes and the return of clouds in the afternoons and even some thundershowers that cool off the evenings. Waters have settled and are mostly blue and holding some pretty decent fish! We still have those larger model tuna off Punta Arenas that seem to average about 40-50 pounds and have really been tough dogged sport these past few weeks and schooling a lot of anglers in how powerful these fish can be. 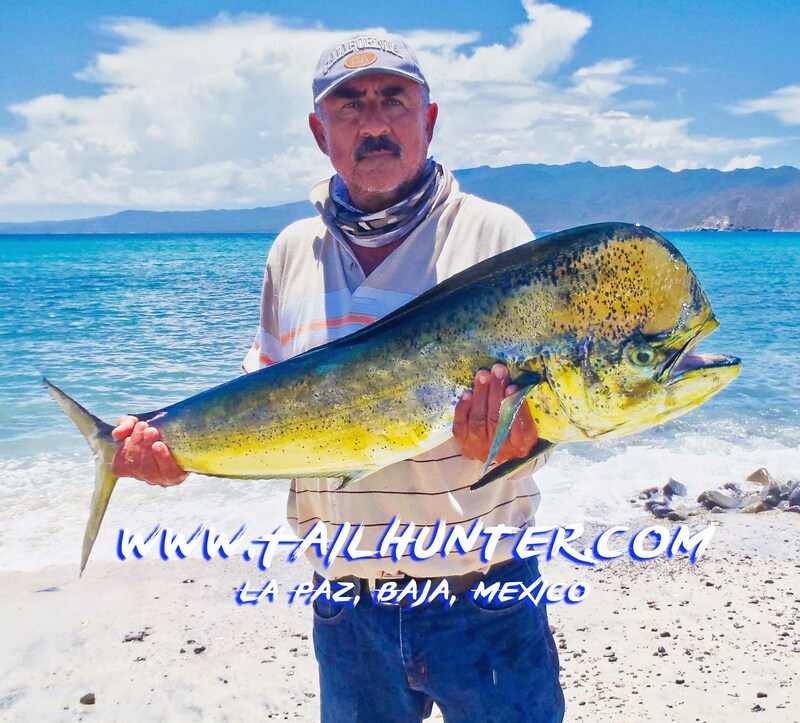 Especially, when success tips in favor of the fish since they are mostly eating light 25-40 pound test which really puts a strain in the angler and his gear. We sure lose a lot of them. However, this past week, we saw fewer of the larger fish and more football tuna seemed to have taken up station. These fish are much much more manageable to most angler since these footballs are 10-20 pounders. They’ll pull hard, but at least they don’t kill you! Rounding out the box, there’s some nicer 10-30 pound dorado that have moved in. Most surprising are the pargo, pompano and some other cooler water species we normally do not see this time of year with the waters so warm. Maybe the waters are already cooling? 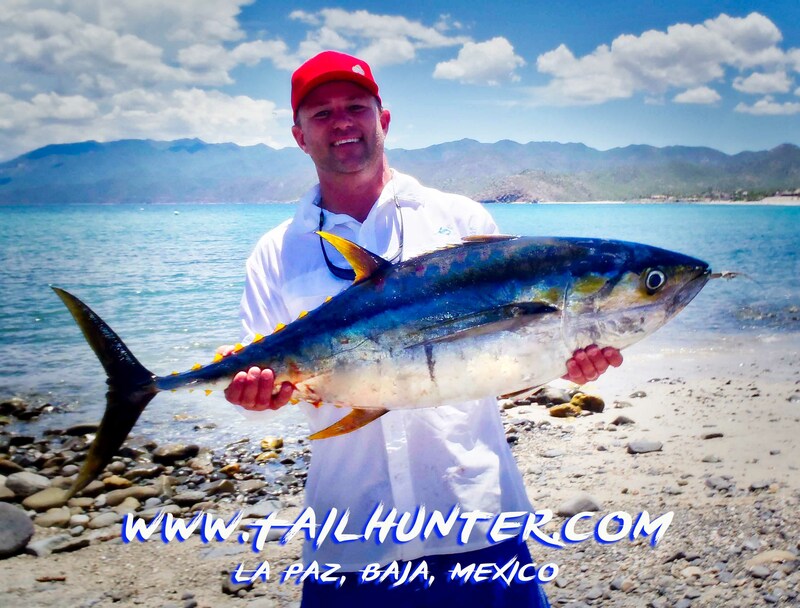 For our La Paz Tailhunte fleet, the bay and around the islands north of town, dorado are still the mainstay with limits or near limits most days. The problems is about finding the spots. It seems the concentrations of fish move around, but once located, it can be crazy off-the-chart fishing. Just a heads-up that the best bite is later in the day or afternoon so be patient. The fish are more willing to feed sometimes just about the time much of the fleet is heading back in. But, our Tailhunter pangas have been staying out a bit later to take advantage of the later bite .